In the photograph (left to right):Cllr Alyson Barnes, Rachael Gildert (secretary of NVCA), Jean Starkie (Church Warden for St Nicholas’s Church), Cllr Patrick Marriott, Simone Cudworth (Chair of NVCA) and Dawn Taylor from Rossendale Community First Responders. Newchurch Village Community Association is proud to announce a new Community Public Access Defibrillator (cPAD) for the village of Newchurch. The group decided to raise funds for this life saving piece of equipment after hearing a presentation by Dawn Taylor and Brian Pickup from Rossendale Community First Responders at a Rawtenstall Neighbourhood Forum Meeting. The group have been supported by the local community and Cllr Paddy Marriott in their mission to get this facility for Newchurch. 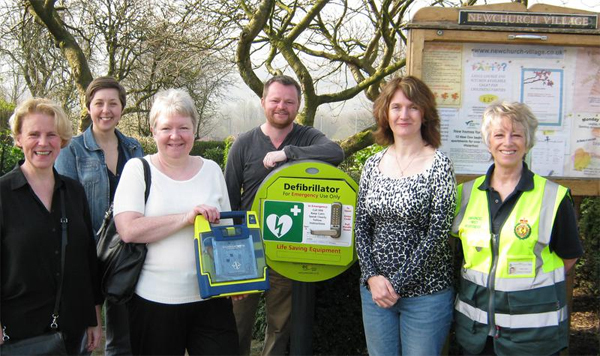 The first cPAD the Valley was installed in February 2011 by award winning Community Defibrillators for Rossendale, with funds raised from the community. These boxes enable rapid deployment of an Automated External Defibrillator (AED), which are designed to enable people with no medical background to assist a victim in a cardiac arrest emergency. When someone collapses due to cardiac arrest – their heart has stopped beating effectively - the first few minutes are crucial. Chances of survival are significantly improved if action is taken quickly. Having cPADs available is a positive move and could, ultimately, save lives. Newchurch Village Community Association would like to thank Mrs Emily Hewitson-Townley and the congregation of St Nicholas’s Church for donating the defibrillator and funds towards the overall project; Community Defibrillators for Rossendale for the donating the housing post, Cllr Alyson Barnes for the Local Member Grant and Rossendale Borough Council for the Neighbourhood Forum Grant which have all helped towards the cost of unit and installation. Another thank you must go to Lee Childs at Rossendale Borough Council for arranging and partially funding the electricity connection and feeder pillar. And to the team at LBS Lighting for undertaking the installation and connections. Community Defibs for Rossendale has facilitated the purchase and installation of several of these units and is happy to assist anyone else who is interested in obtaining a cPAD for their area. The team will also deliver free, two hour CPR training and defib familiarisation sessions to members of the public, who wish to find out how the defibrillators work and to give them the confidence to use one should the need arise. Please Contact Dawn Taylor on 07812 303856.